Verify account balances, view transactions, obtain interest rates, transfer funds between accounts, etc. ISB offers a broad range of transactional services and deposit account options. Build up the equity you have in your home. Get the home equity loan that will help you make the most of it. Local decision-making, in-house loan servicing, people you can ask for by name, and a long-term commitment to taking care of customers. These days, nobody has to explain why fiscal responsibility and operating soundness are more important than ever. All deposits are FDIC insured. Investment Savings Bank is a community-based, PA-chartered, "well-capitalized" FDIC-insured Mutual Savings Bank and mortgage-based lending specialist. At ISB, proving to you that “It’s Simply Better” is a challenge we both welcome and embrace; to be nothing less than the most customer-friendly, community-focused, forward-thinking, and fundamentally four-square financial, anywhere; and to find ways to distill those virtues down to 3 letters, 2 locations, and a single, unwavering commitment to make our little corner of Central PA a “SIMPLY BETTER” place for you. I-S-B. It’s…Simply…Better. ISB offers a broad range of transactional services and deposit account options – from Back-To-Basics Checking and Passbook Savings to our signature Money Markets, CDs, and NOW Accounts; from conventional and ROTH IRAs to Education and Health Savings Accounts – all designed with the same goal in mind: to help get you from one “landmark event” to the next. Not sure which account route is best suited to get you where you need to go? We can tell you the signs to be on the lookout for – and we’re always happy to help point you in the right direction. 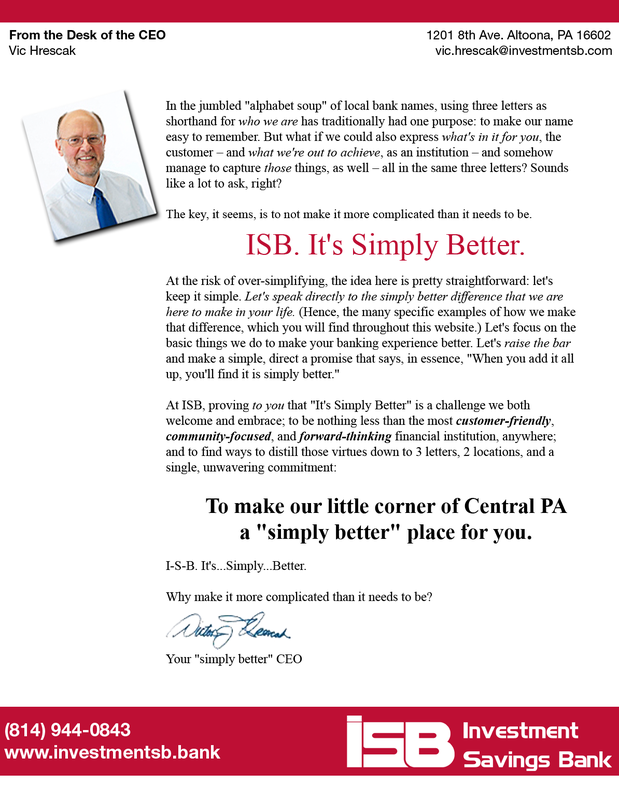 After all: providing ISB’s unique brand of “service with a smile” is why we’re here! In the jumbled “alphabet soup” of local bank names, using three letters as shorthand for who we are has traditionally had one purpose: to make our name easy to remember. But what if we could also express what’s in it for you, the customer – and what we’re out to achieve, as an institution – and somehow manage to capture those things, as well – all in the same three letters? Sounds like a lot to ask, right? The key, it seems, is to not make it more complicated than it needs to be. At Investment Savings Bank, it’s SIMPLY BETTER! Investment Savings Bank is the easy choice to help you navigate your banking experience. Whether you seek effective ways to save, manage your transactions, or seek personal or commercial lending to help you make purchases or travel, the professionals at ISB want to make things easier for you. We are the local bank with the large selection of convenient services, consistently striving to make “It’s Simply Better” our daily way of life.